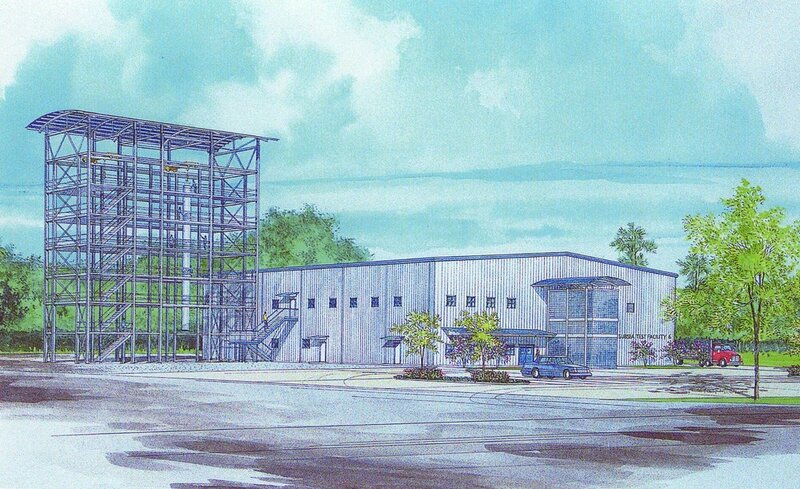 Crump Wilson Architects designed this 24,400 SF testing facility. The facility houses two two-story tall heavy industrial test areas in addition to a two-story area that contains support spaces on the first level and administrative offices on the second level. One, five, and fifteen ton cranes are located throughout the test areas of the building. Utility services were provided at various work stations throughout the test areas. A major feature of the facility is an 85' tall “Cell Tower”. The Cell Tower features two 30 ton bridge cranes with remote control operators and working platforms at 10' intervals. The 30 ton “tools” are stood up vertically for pressure testing. Removable blast curtains protect people and property from possible explosions.